A monarch butterfly at the Kalamazoo Nature Center. A tagged monarch at the nature center. Jen Tagett is the citizen science coordinator at the Kalamazoo Nature Center. A sheet of butterfly tags. Jen Tagett demonstrates how to safely hold a monarch. The nature center is raising monarchs in an enclosure. Ashley Cole-Wick (L) and Jen Tagett in the nature center's arboretum. Bees love joe pye weed, and so do butterflies. A tagged monarch in Cerro Pelon, Mexico (lower left corner). MSU assistant professor David Mota-Sanchez with a tagged butterfly. They’ll fly several thousand miles to the oyamel fir forests in Mexico to spend the winter. You can play a small part in this incredible migration by helping scientists put a little sticker on butterflies to track them. The Kalamazoo Nature Center is one of many places where you can do that. You can actually order a kit online and do everything yourself, but sometimes it’s easier to have someone show you how first. I met up with Ashley Cole-Wick to learn how to do it. She's the center’s biological research director. “These little tags are essentially tiny little stickers that each have a unique code for each butterfly that’s tagged, like a social security number or a driver’s license number,” she says. We’re standing on a wide porch in the woods outside the nature center. The center’s citizen science coordinator Jen Tagett is holding a male monarch in her hand. She slowly peels a little white tag from the sheet. “I’m trying not to touch the sticky part because I want the majority of the sticky part to stay on the butterfly, so it maintains for its entire migration,” says Tagett. She gently presses the sticker on part of the hind wing where it won’t inhibit flight. It’s called the discal cell. “We say ‘put the sticker on the mitten’ because that cell kind of looks like a mitten,” she says. These butterflies are ones they’re raising inside the nature center. After they tag them, they release them into the wild. Tagett and Cole-Wick write down some data about the butterfly, including its unique code on the tag. "They’re a little bit more hardy than you’d expect, but what I’m doing is holding all four wings together so it if does struggle a little bit I’m keeping everything contained so it doesn’t injure itself,” says Tagett. Tagett presses the sticker on, and lets the butterfly go. “Up, up and away!” says Cole-Wick. The monarch flutters up above our heads, off into the woods. The nature center holds monarch tagging walks that are open to the public every Tuesday in September. For those, they catch wild butterflies. Ashley Cole-Wick says anyone can tag monarchs, even little kids. “Some of my favorite people we’ve had come to our walks are a couple moms that bring their kids that she home schools and they call it P.E. I’m like, 'take these nets and go catch monarchs!' because they are very fast fliers," she laughs. "An insane number of tags." 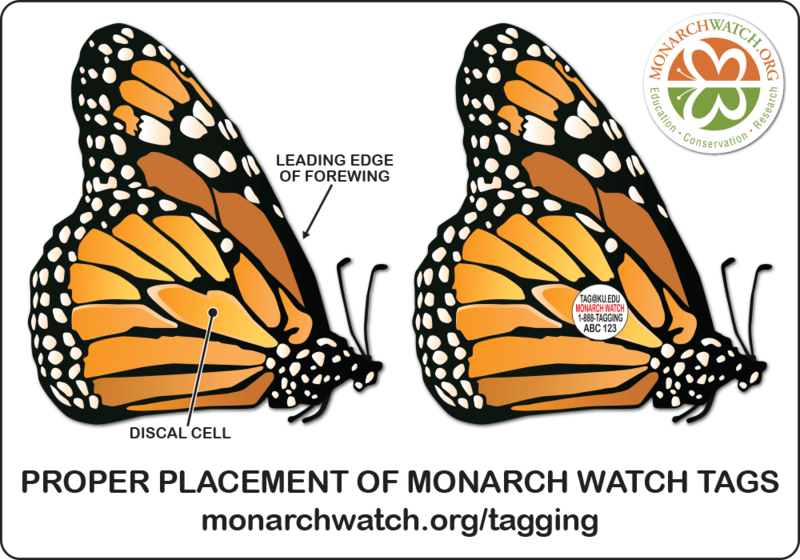 The nonprofit group Monarch Watch has been running this tagging program since the 1990s. Chip Taylor is the group’s director. He says people have tagged about 1.4 million butterflies since 1998. “The interest in tagging has increased and last year we sent out an absolutely insane number of tags due to requests. It was 320,000 tags and this year it’s even more than that,” he says. Scientists want to keep a close eye on monarchs, because it’s estimated the population has dropped by more than 80% over the past 20 years. Chip Taylor says they’re able to learn things about the migration they couldn’t without all these volunteers. For example: if you’re a butterfly, it’s better to migrate earlier in the season. “And it’s also clear that if you’re getting to Mexico, it’s better to be from the Midwest than it is to be from further east,” he says. Taylor says the tagged butterflies are really hard to find in Mexico: just one tagged butterfly for every 20,000-30,000. David Mota-Sanchez was lucky enough to see a tagged monarch, among millions of butterflies that coat the fir forest. He’s an assistant professor in the Department of Entomology at Michigan State University. He says it's a beautiful sight. “It’s amazing. You can hear the noise of their wings when the monarchs are flying,” he says. He says people who live close to the sanctuaries watch out for the butterflies as they spend the winter huddled on the fir trees. Mota-Sanchez says the most noticeable wave of butterflies arrives in Mexico at the beginning of November, coinciding with Dia de los Muertos, or the Day of the Dead. He says the traditional belief is that the monarchs represent the souls of ancestors returning to visit. “The people in Mexico, people from the local community, are also citizen scientists. They are working really hard with the federal agencies, with local agencies, to preserve the monarch butterflies and they care about the butterflies,” he says. If you want to tag butterflies, it’s not too late, although Monarch Watch's Chip Taylor says if you want to order your own kit, you should do that this last week of August. You can learn more here. If you'd like to join a monarch tagging walk at the Kalamazoo Nature Center, you can learn more about the walks here. They're held at the nature center every Tuesday in September, from 2-4 pm, weather permitting. You can learn more about the best plants to add to your yard to help monarchs, in this video from MSU. A diagram showing the proper placement of the tag. Monarch butterflies need more to eat. That's the conclusion of a new study from the U.S. Geological Survey. The only thing monarch butterfly caterpillars can eat is milkweed. Wayne Thogmartin is a quantitative ecologist with the USGS. He says the butterfly population has dropped by about 80% since the mid-90s. The population has rebounded a little bit in the last three years, but Thogmartin says it's not a huge improvement. Scientists continue to keep a nervous eye on North America’s eastern monarch butterfly population. That population has dropped by more than 80% over the past decade. A study published this week in the journal Scientific Reports suggests there’s a “substantial chance” that monarchs could become “quasi-extinct” within the next 20 years.